February 11th, 2019 by Pamela V.
The minivan turned 35 this year and Fiat Chrysler Automobiles (FCA) debuted a new Chrysler Pacifica. The new and improved minivan model, the 35th Anniversary Edition, debuted at the Chicago Auto Show– while writing this story. (February 9th- February 18th). The styling changes are minor but cnet.com is calling the 2019 Chrysler Pacifica special edition “minivan marvels”. “We created the minivan segment, we’re proud of our place in it, and we will continue to innovate as we’ve done with the first hybrid minivan, industry-exclusive Stow ‘n Go seating, Uconnect Theater with 10-inch touchscreens in the second row and much more,” said Steve Beahm, Head of Passenger Car Brands, Dodge// SRT, Chrysler and FIAT – FCA North America. “More than 14.6 million families have created lasting memories in their minivans throughout the past 35 years, through home projects, road trips, soccer practice you name it. There’s no better way to commemorate the anniversary of the people mover that does it all, than by introducing an edition that offers even more value to today’s families”. Over the years, Chrysler has introduced many thoughtful innovations, such as Stow ‘n Go seatings and Stow ‘n Vac. Chrysler was also the first minivan manufacturer to introduce, a hybrid model of the Pacifica in 2017. Customers who choose to buy a special edition model will see several changes from the minivan that they are not used to. For starters, one change is that the special editions will not be available in all vehicle trims. What else is there? The Anniversary Editions will be offered in hybrid and non-hybrid versions; for the Touring L, Touring L Plus and on Limited trim levels. The Pacifica Hybrid, which boasts up to 32 miles of all-electric driving range and 520 miles of total range from its plug-in hybrid drivetrain, will be available as the 35th Anniversary Edition on Touring L and Limited trim levels. Anniversary Pacificas will have a 35th Anniversary badge on the outside. They will also have liquid chrome Chrysler wing badges and gloss black trim on the front fascia and rear liftgate. Fascia often refers to the decorative panels of car’s dashboard, or the dashboard assembly. For those wanting the Anniversary Edition, they will find they have the option to purchase an optional S Appearance package which adds a black grille, headlight accents, rear valance molding, badges and wheels to the exterior. The inside will have a sleek black interior and will have Cranberry Wine accent stitching on the Nappa leather seats, steering wheel, and door panels. The 35th Anniversary logo will also be embroidered into the front floor mats. There is more than meets the eye with this edition. Depending on the trim level that is ordered, Chrysler can throw in some extra equipment, such as 20-inch wheels on the Pacifica Limited. And if one color isn’t enough, there are 10 different paint options available to choose from. Each edition is customizable to the needs of the customer. Here’s what else is featured in the Anniversary models. 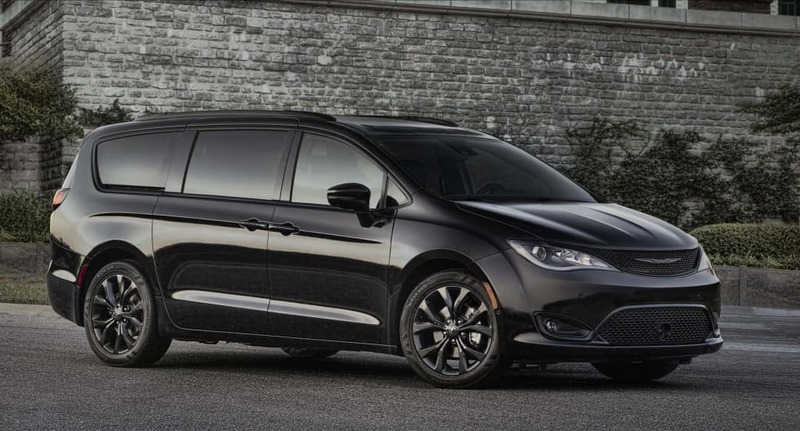 The 2019 Chrysler Pacifica 35th Anniversary Edition will go on sale this summer. There’s no pricing available yet, but you can expect a drastic price increase of the regular models isn’t in the cards. Here’s a reference, the 2019 Chrysler Pacifica Touring L begins at $37,790 (plus a destination fee) while the full-zoot Limited starts at $45,940 (plus a destination fee). Until the Anniversary Edition makes its arrival this summer, come see for yourself if the Chrysler Pacifica is the right vehicle for you at our Hollywood Chrysler Jeep.